Jack White (vocals, guitars, songwriting), Brendan Benson (vocals, guitars, songwriting), Jack Lawrence (bass), and Patrick Keeler (drums) are The Raconteurs. On January 30th, the Detroit supergroup will release a very limited edition vinyl-only single, "Steady, As She Goes" backed with "Store Bought Bones". 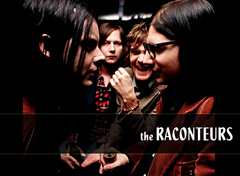 Jack says The Raconteurs are "A whole new band. A dual attack with dual guitars, dual vocals, and dual songwriting".